The Italian shoe company Vittoria holds true to it’s roots as they are still manufacturing their shoes in their 1,000 square meter facility in Vigliano Biellese, Italy. Founded in 1976 by Celestino Vercelli following his professional racing career, the brand was born and is still currently run by him and his son today. Fast forward 10 years after inception and Stephen Roche took his Vittoria shoes to victory during the Giro d’Italia, Tour de France and World Championships. During 1998 Marco Pantani pulled off the stunning feat of overall victories in the Giro d’Italia and Tour de France in the same season while wearing Vittoria’s. Today the Italian brand is still innovating with their latest Vela shoe. Speaking of innovation, we spotted a shoe with a device similar to the Boa system which Vittoria made back in 1992 which possibly came a little early for the market back then. A pair of older shoes collect some dust as they sit in the factory. Vittoria had a similar system to the Boa back in 1992 that was maybe a little ahead of it’s time. The factory is made up of all different machines and tools to configure their products. Even with all of today’s technology the hammer is still be used in the factory. A pair of Marco Pantani’s signature shoes. A new pair of Vela shoes that show off a color that didn’t make it into the available line up. A line of soles ready to be put together. The toe box of the newly crafted shoes get pressed. Another pair of Vela’s that didn’t make it into the color line up, these one’s though were our favorite. Before the “upper” portion of the shoes head out to the stitcher. When Italians say they’re handmade, here you go. A box of leather upper’s prior to getting stitched up. There is no shortage of shoes in the Vittoria factory. A prototype before the final new “Vela” shoe came to life. 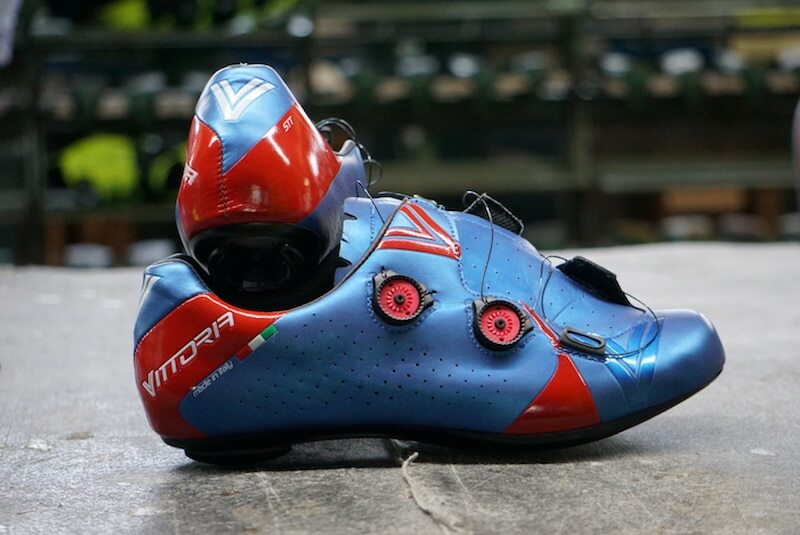 Vittoria had a similar system to the Boa they used prior to using Boa on their new shoes. Old shoes, new shoes and most of all colorful shoes. A closer look at the ’92 shoe with a similar concept to the Boa dial. What’s a factory tour in Italy without espresso?